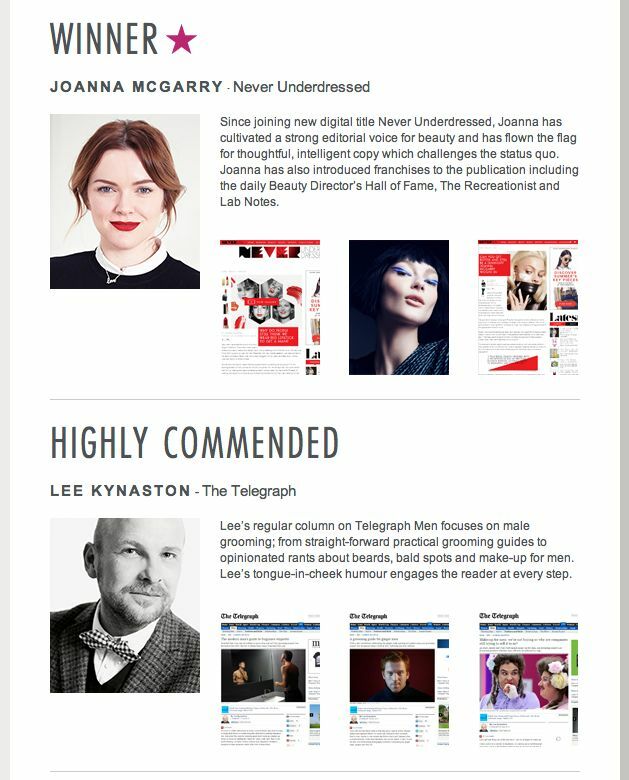 Aw, am very excited today to have been High Commended in this year’s Fashion Monitor Journalism Awards for my male grooming column on telegraph.co.uk. One of the judges very kindly said it was the first time she’d actually LOL’d at a piece of beauty journalism which is just about the highest compliment I could have been paid because, at the end of the day, I write about deodorant and fake tan for a living. And if that’s not funny what is? PS. Huge congrats to Joanna McGarry on her well-deserved win and a special mention to my pal Mark Smith who was also shortlisted in the online category. If you love spa treatments I implore you to check out his excellent blog, The Spa Man, which is one of my favourite online destinations.